Apart from being part of Char Dham pilgrimage, Dwarka is also one of the seven sacred cities of the Hindus or ‘Sapta Puris’. Tradition has it that Lord Krishna left Mathura to settle on the west coast of Saurashtra, which later became famous as Dwarka, a well-known city in Gujarat. Located at the Kathiawar peninsula on the confluence of Gomati River and the Gulf of Kutch, Dwarka is at its exuberant best during the festival of Janmastami, the day of Lord Krishna's birth, when the town’s chief attraction, Dwarkadhish Temple, attracts thousands of visitors. One of the most revered temples of worship in India, the original Dwarkadhish Temple is a temple of antiquities comprising thousands of years. However the present structure dates back to the 15th-16th century. Also known as Jagat Mandir , the Dwarkadhish shrine, dedicated to Lord Krishna, this magnificent monument, with its 78.3m shikhara (spire) topped by a huge flag showing the sun and moon, is supported by seventy-two pillars. 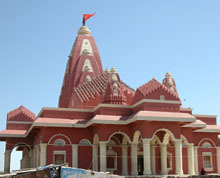 Bhadkeshwar Temple is another sacred attraction in Dwarka. The lighthouse at Dwarka fascinates those visiting the town to have a panoramic view of the surroundings. Mobile phones and cameras are not allowed. One of the four mutts (monasteries) established the great Hindu theologian Shankaracharya, Shri Jagatguru Shankaracharya Math at Dwarka is held in reverence by the Hindus. Other three places where Shankaracharya had set up monasteries are Sringeri in Karnataka, Puri in Odisha and Badrinath in Uttrakhand. Dedicated to Rukmani, the chief queen of Lord Krishna, the centuries old temple is located 12 km from Dwarka. Rukmani was the daughter of the king of Vidarbha. 13 km from Dwarka, Nageshwar is one of the twelve jyothirlings this is located on the way to Bet Dwaraka. How to Reach Dwarka by Air: Airport at Jamnagar is the nearest one to Dwarka. How to Reach Dwarka By Rail: Belonging to the Western Railways, the Dwarka railway station is directly connected with different cites including Ahmedabad, Jamnagar, Mumbai, Porbander and Rajkot. 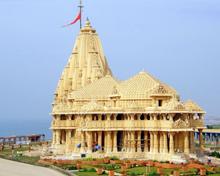 How to Reach Dwarka by Road: Dwarka is easily approachable by regular buses, taxis, coaches and tourist cabs from different places in Gujarat. Some of the cities and places in Gujarat connected with Dwarka by road are Jamnagar (35 km), Okha (32 km), Porbander (120 km), Rajkot (234 km), Somnath (249 km), Junagadh (332 km), Bhavnagar (399 km) and Ahmedabad (450 km). 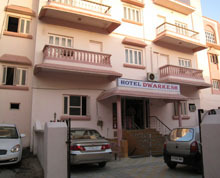 Being an eminent travel and pilgrimage destination, Dwarka has a wide array of accommodation options to choose from to suit all budgets. Ranging from luxurious hotels to budget hotels, these hotels in Dwarka are a perfect base from which to explore the different sights in and around Dwarka. Hotel Dwarkesh, Hotel Gokul, Hotel Guru Prerna, Hotel Krishna, Hotel Rajdhani, Damani Atithi Griha, Hotel Meera, Uttam Guest House, Shriji Guest House, Hotel Sunder Palace, Hotel Darshan, Hotel Dwarka Residency and Hotel Vandana are some of the famous accommodation options available in Porbandar.